The 2014-2015 Serie A schedule is now available. 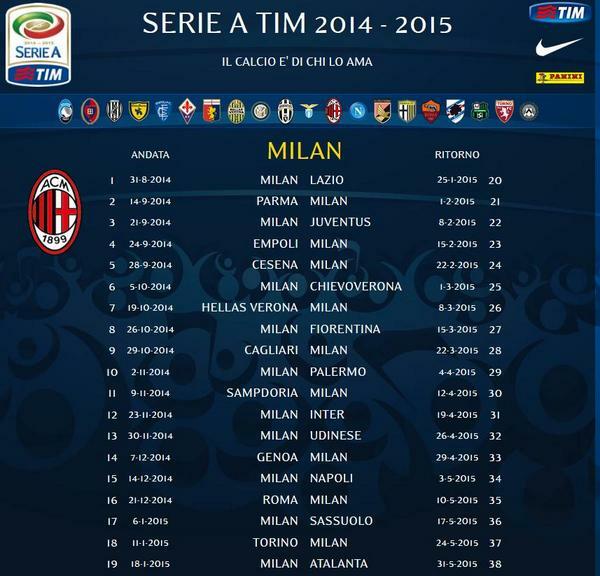 Milan’s start is different from many recent seasons, it features bigger teams. Not that playing smaller teams has helped much before and in any case it remains to be seen if this team will be ready to compete from the start. The season starts with games vs Lazio, away to Parma and vs Juventus. The derby games are in November and April. Jozy Altidore was again available but not in the USA starting line up. Divock Origi started for the Belgians. Origi tested Tim Howard inside the first minute taking a Kevin De Bruyne pass and shooting from an angle. The first threats to the Belgium goal arrived in the 20th minute from a header off a corner and moments later a Clint Dempsey shot troubling Thibaut Courtois. Three minutes later De Bruyne wasted a good chance on the counter when he shot just wide. An Eden Hazard shot/cross was saved almost off the line by DaMarcus Beasley. Belgium had more shots on goal and corners but were never overly dangerous. The half time had many wondering if Belgium will be caught on the break. The 55th minute provided the next good Belgium chance as a Jan Vertonghen cross was missed by both De Bruyne and Origi. Belgium kept trying and Origi got another chance as his header hit the top of the crossbar and a Vertonghen volley went wide. US countered and provided uncomfortable moments in the Belgium box. Tim Howard kept USA in the game when Belgium’s possession resulted in shots on goal. Sub Kevin Mirallas injected good speed and forced Howard to be at his best again. Time and time again either Howard was there or Belgium just missed. Into added time Chris Wondolowski had the chance to steal a win but he shot way high with only Courtois to beat. It was one of the bigger misses in memory. Early in extra time Romelu Lukaku, only just on for Origi, beat the defender ran over 30+ yards and crossed to De Bruyne. De Bruyne turned and shot past Howard into the far corner. With the US pushing forward Lukaku finished off well. Youngster Julian Green was thrown in to provide some offense, the Bayern Munich player almost immediately scored when he collected ball shot into the box and beat the offside trap, this game was only his third cap. A late flurry didn’t lead to further goals. The US did well but it was mostly due to Tim Howard. The first half was relatively eventless with Argentina mostly disappointing. The best chances of the first half were probably by the Swiss and in particular Josip Drmic wasting a chance to run at the Sergio Romero goal. Argentina then began to take more control but wasted chances with missed headers in particular. Lionel Messi was often covered well. Xherdan Shaqiri gave Argentina defense a few small scares and Romero did look tentative. Angel Di Maria wasted a good chance to cross. The second half was somewhat more open but had few shots on goal. Argentina controlled more but didn’t threaten the Swiss goal too often. A few poor fouls and tackles and a relatively quiet Swiss threat meant the game needed extra time. The game trotted along with more of the same wasted and not good enough chances for Argentina. With less than three minutes to penalties Stephan Lichtsteiner could have done better but he let Messi start a run and pass right to Di Maria. The latter shot into the far corner. The Swiss had a chance to equalize when a corner found its way to the other side where Shaqiri crossed back into the area. Blerim Dzemaili headed off the post and the rebound bounced off him just wide. A last second free kick just outside the area offered a last chance for the Swiss. Shaqiri hit the wall and the whistle sounded. Odd makers gave Algeria almost no chance. The first minutes were much more even than anticipated. The German central defense was not exactly solid and lacked pace. Per Mertesacker and Jerome Boateng left a lot to be desired and Mats Hummel was perhaps missed. Playing a bit too high meant that Manuel Neuer seemed to be needed as a sweeper. Sofiane Feghouli and Islam Slimani starred for the North Africans. Thomas Muller was the main target for Germany and Mesut Ozil created for him. Andre Schurrle came on at half time to add another dimension to the German attack. Rais M’Bolhi remained solid when called upon. Algeria continued to threaten too. A lack of finishing meant that both teams were inevitably heading to extra time. Extra time was quick to produce a goal. Andre Schurrle was assisted by Thomas Muller. Algeria kept trying but the game was pretty much over but not before Ozil shot in from Schurrle and Abdelmoumene Djabou from a Feghouli cross. Laurent Koscielny started in place of Mamadou Sakho. The opening minutes were balanced with perhaps Nigeria doing better. The game opened up when first Emmanuel Emenike and then Karim Benzema were called offside. Shortly after those offsides a Mathieu Valbuena cross found its way to Paul Pogba who forced a good Vincent Enyeama save. Both teams had chances and Nigeria could had a penalty because Patrice Evra was virtually hugging the Nigerian when late in the half the Africans had a corner. Early in the second half Blaise Matuidi was lucky to stay on as he went in hard on Ogenyi Onazi. At the 70th minute an exchange between sub Antoine Griezmann and Benzema led to the latter almost beating Enyeama. The ball continued towards the empty goal but was shot away by Victor Moses before it crossed the line. Minutes later Yohan Cabaye hit the crossbar. Benzema forced a good punching save but some of credit Enyeama had accumulated was lost when during the resulting corner he let himself get stranded and Pogba headed in. Griezmann had a chance to double the lead soon after. Into added time a simple Peter Odemwengie mistake led to a corner for France. The resulting corner was relatively easily sent into the box and a Valbuena pass/cross was deflected in by Joseph Yobo. Griezmann wanted to claim it but it went down in history as an own goal. Milan fans can visit The Free Bet Guide site to get the very latest Betfred promo code for football betting. When joining a bookmaker check the aceodds.com list of bonus codes to find the best offer.